Easily adjust the size and configuration of your wine collection with this 12-bottle*, stackable hardwood rack! Designed to fit securely one on top of the other for space-saving storage. Strong, weighty hardwood allows you to stack from floor to ceiling safely. Openings Size: 3.75" x 3.75"
i NEED A 24IN X 24 IN WINE RACK, WILL THIS FILL THE SPACE ? BEST ANSWER: The dimensions of this rack is 15-1/2"H x 18-7/8"W x 10-9/16"D.
Inside dimensions? Will this hold Burgundy bottles? Yes, it will hold standard 1 liter size French bottles easily. Will champagne bottles fit in this? BEST ANSWER: The 12 Bottle Cube-Stack Wine Rack is designed specifically for standard 750ml bottles. 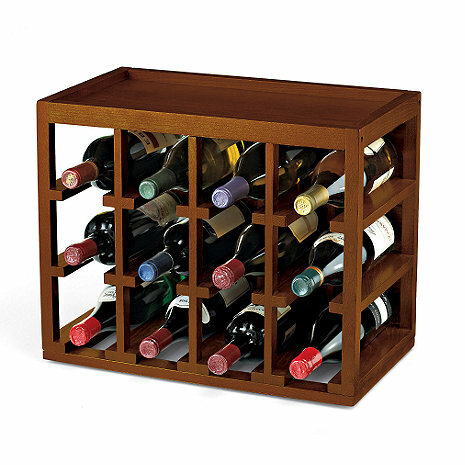 A great alternative is the Cube Stack X-Style Wine Rack (Walnut), item number 640 01 03. This won't hold 12 champagne bottles but probably 8 to 10 bottles will. Currently the Walnut is our only finish available. We are stacking 4 of these and need to know the best way to attach them to the wall and to each other. Any suggestions? BEST ANSWER: I would probably anchor them to the wall through the two rear vertical uprights. Could this itme be wall mounted? I would like to put the product on a wall and have stools under it. Is the product back(backboard) strong enough wood to put screws through it into studs mounted with lag bolts (maybe 6 or 8 bolts into studs that are wood) to hold the 12 bottles and rack? 15-1/2"H x 18-7/8"W x 10-9/16"D. If you have any further questions, feel free to call a Storage Consultant at 800 377 3330. Thank you again. can i get a sample of the wood? Although this product looks nice in the end, the quality is not worth the cost and time to assemble. Directions are vague and holes in wood do not always match up, making it easy to break the wood. This is not the easiest thing to assemble, but it really isn't very different from many other furniture kits in that characteristic. I believe the assembly diagram that comes with it has some minor errors in terms of the orientation of a couple of the pieces (specifically C and E), so I would advise you to look over the entire procedure BEFORE assembling anything. If you do that, it will be obvious as to how C and E must be oriented. Once you have put one together, it is a lot easier to put together subsequent units. The end product is very sturdy. While it won't be confused with fine furniture, it looks OK; in fact, it looks fine if you don't get too close to it. I'm using them on an open bottom shelf of a unit I have, and they look great there. Personally, I think they are a bit overpriced for what you get,[...]My advice on the back is to ignore the holes on the unit. It isn't that difficult to drive a screw into those pieces of wood and you really don't need the little "dots" they've put on the unit for that purpose anyway. I think you should put the back on because it adds additional stability to the unit. Although I'm not stacking mine, it looks like they would stack well because of a male/female arrangement on the top/bottom of the units. I like the way way they hold the bottles. Overall, I am satisfied with them. Much more assembly required than expected, not worth the price for the work needed. Complex arrangement of pre-drilled holes were wrong size, wrong location, or missing entirely. Without a background in woodworking to make up for the poor work at the factory, we would not have gotten this together at all. We could use more of these in the space we have, but for the work required I'll build my own before buying this again. VERY difficult and time consuming to assemble. Mislabeled parts and rudimentary instruction proved difficult in assembling this product correctly the first time. I bought 4 stack-able cubes: 2 of the regular wine holder, 1 of the ones with the x and one of the glass holders. When I went to assemble them, one of the regular cubes and the glass holder cube broke (the wood split quite badly when screwing in a screw). I ordered one of each again. The second time, I was incredibly careful and the glass holder split again. I would not have ordered IF I would have seen how complicated the assembly was. One down and two to go! NO Written instuctions just pictures and they are FAIR at that. Would have been nice had someone said what the A, B, C, Etc were like top, bottom, side!!!!! Hard to put together and flimsy. Delivery was excellent, arrived in good condition. The dowels were too big for the holes so I had to get out my drill and make them fit. I do not think a lot of customers will be willing to do this. But it's likely that every shipment has a different configuration. The dowels could be fine in yours. Poorly constructed, cheaply made. Holes not in correct locations and wood split trying to put in pegs that were too large for holes. Bought from here once before, cheap product, thought I'd give them another shot........NEVER AGAIN! The wine rack was easy to put together - looks nice and works great. These are perfect for our wine cellar we bought guy two. Good wood color. I bought 4 wine racks and 2 of the wine glass holders to make a 6 cubed wine and wine glass storage area. It looks awesome in our wine storage area of our dining room. They were relatively easy to assemble and look great. Don't be fooled by the 'light finish' - the color looks very much as dark as it does on the computer monitor (which I was happy with). I love this product for storing wine in my kitchen. It's compact, sturdy, good-looking, and holds the wine bottles very securely. The only negative was that it was not as easy to assemble on my own as I had assumed - I needed another person's help. The instructions and diagrams were very clear, however. Overall, though, it's very satisfactory, and if I needed more storage for wine, I would purchase another of these cubes. Great way to store wine. Bought separtely or as I did in a complete set, excellant purchase. I had shopped around, online, for a while and finally selected Wine Enthusiast's Cube-Stack Wine Bottle & Stemware Rack, a set of three racks. I added a fourth rack, VERY stackable, so I have two X-Style racks, allowing me to store about 50 bottle total. I don't use the stem ware rack to store my wine glasses, also bought from Wine Enthusiast's, but store about 20 bottles in just this section. The 4 stacked racks are very nice looking, sturdy. Easily put together. Excellent purchase. Excellent rack - real mahogany! Bought 2 bottle racks and a glass rack. great stacked!! I could not possibly make these for the price I paid. Very attractive and useful. I already had one, just needed one more for more wine. Great rack for stacking. The pre-drilled screw holes had to be enlarged to complete the assembly without damaging the screw heads. I have 4 of these, easy to assemble once I'd fumbled around a bit with the first one. Parts could be better marked, and the instructions more clear. But, looks fine and works as advertised. Overall this product is a good deal for the money and I would recommend it to anyone who wants to increase their overall inventory of wine within the home. Too much wizz and not enough bang! Delivery of the product was very prompt, and it arrived in perfect condition. WOODEN PEGS WERE TOO LARGE FOR THE HOLES, ONLY FEW OF THEM WERE MACHINED CORRECTLY. "What a workout putting it together!" We had an under the counter space that we could not find a electric vented cooler that would fit so two of these serves as the storage for red wine. Purchased this item along with 2 of the matching/stackable wine glass racks. Unit is very sturdy and attractive, but extremely difficult to assemble. Had to get my husband and his tools to put it together. Now that it's done, I love it! Looks good, Design needs some help & Assembly is a little rough. * No it is not easy; however, some common sense goes a long way. * Do not tighten all screws until final assembly. * Use an Ice pick to help deepen the dimples prior to putting screws in. * Pay attention to not split the wood during putting the screws in. * The Part-K screws are simply too long, I decided to change them out with ones that are 3/8" shorter. * BIGGEST HELP - take your time. Once assembled - I really like the rack, it looks nice and it is sturdy enough to hold the weight of all the bottles without any wobbling. I loved the size, but I can build upon this and add other cubes-needed something that I could lay my bottles down. I have four of these, stacking one on one, no higher for stability sake. Once I got the weird construction figured out, no problem with putting the other's together. I have the dark stained versions, they look very nice and, most important, are very stable and solid. I segregate some of the wine collection by stack - one for Aussies, one for Foley's, one for top shelf Cabs, etc. I would have given this 2 stars except the mahogany is quality wood. Unfortunately, the holes in the wood are not drilled deep enough meaning I had to redrill all of the assembly holes. The provided brass screws are also poor quality - use a manual screwdriver not an electric one otherwise you'll strip the cross head very easily. The assembly directions are poor and do not cover how to fix to a wall for multiple stacking - i had 3 cubes stacked on top of each other - nor are the fixtures provided suitable for that. Love the rack, but I was sent instructions for a different model, which made assembly a challenge. The wood used for the top panel is flimsy and chipped easily along the edge. It's not visible where I have the shelf, so not a big deal, but putting shelf in another place might be a problem. Product was missing the dowels. Quick trip to Home Dep fixed. Very difficult to assemble. You need three hands. I ordered 14 cubes. The idea is perfect for my small wine closet. I've stacked 4 high and mixed the 12 bottle stacks with the x-cubes. However, the assembly was a pain. The 12 bottle cube stack had many parts and I had to force some of the screws to fit. I returned 2 due to several of the parts being larger and not fitting properly. The x-cube was much easier to assemble but not quite as sturdy. I still have room in my closet for more racks but will look at other designs. If you only need a few racks, this is a good product to purchase. Any more than 4 and make sure you have lots of time and patience to assemble. I like this product but not easy to put together you need two people. Assembly was very difficult. The screws and pilot holes didn't fit. I had to re-drill the pilot holes and buy new shorter screws. I have never bought any item where the directions for assembly were so difficult or where the the actual assemble needed so much strength. I finally had to get my son who is an engineer to build it for me. That said, it looks good, seems strong, and fits where I needed it to go. Our two cube-stack wine racks were very easy to put together. Everything fit together exactly the way it should. I was very happy with the product, and they look very attractive filled with the wine bottles. Will probably order more in the future. great wine rack, it just happen to fit exactly between my wall shelves, I need 2 more, waiting for a sale as they are not cheap. Once it was put together I liked it, but the assembly was not fun and not easy. I bought 4 of them and needed help to do it. It's a two-person job. Next time I'll buy something that doesn't have to be assembled. Delivery took over two months! Customer service kept telling me the item was on back order, but I was "their priority customer." Finally, I cancelled the item, but they shipped it anyway. This is a very nice wine rack but not worth the hassle. Won't be buying from this retailer again. You'll need a power drill to screw this thing together. It's not difficult, but, well, you'll need to know how to screw properly.